When I used to visit my parents in Chattanooga , TN. I always knew where I might spot a bluebird. Walking to that vision was one of the first things I would do after I arrived there. Sometimes I would get to the point where I knew I could spot them and they wouldn’t be there ; maybe a robin would be there in its place. Then, as I walked home disappointed, I would find a bluebird in an unusual spot. 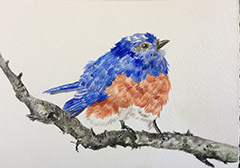 There he was as if to say,”See, don’t give up on your wishes, Missy.Things are not always arranged as you want them to be.” Now that I live in Santa Barbara I have a special place where I can see bluebirds too. Like hiding stashes of candy in designated spots I usually know where my treasured vision of a bluebird will be. This morning I really wanted to see one and so I walked to my spot. There were no bluebirds to report and I started to walk away disappointed until an Allen’s Hummingbird flew in my vision. “See,” he seemed to say,”sometimes you don’t get what you want, you get what you need.” ” Ok, Mick,” I said in return, just grateful to be able to see this beautiful world.